Comfort, fit and durability are all wrapped up in this Pro Lowback seat. This seat is designed without a headrest, with all the superior features. 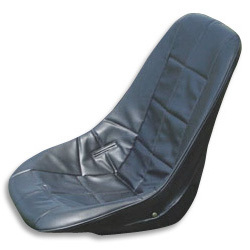 A double walled molded shell, slots for seat belt or shoulder harness applications, permanent mounting studs molded into base and upholstered in deep comfort weave thick foam padded Black Vinyl cover. Dimensions: 24" Tall 20.5" Wide, Weight: 12lbs. This seat works best with the Deluxe TrikeBuggy only (not the Basic).